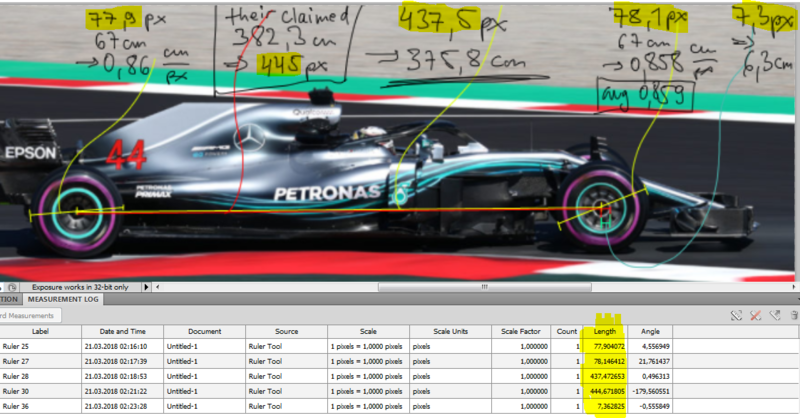 CircusF1 claiming W09 not only retained it`s wheelbase, but it increased instead by another 63mm taking the mercedes to a whopping 3.823mm. SF71-H on the other hand should be 120mm longer than it`s predecessor... taking the ferrari 2018 car to 3.714mm. 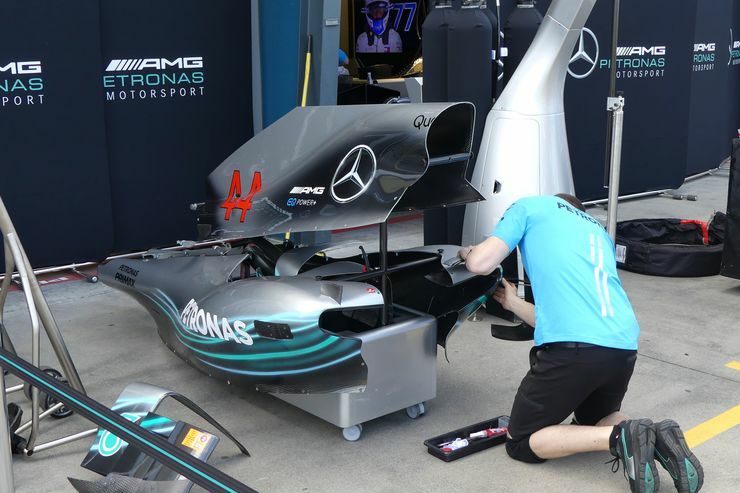 Mercedes have claimed the wheelbase of the W09 is the same as the W08. In any event an increase of 63mm would be noticeable to the eye, especially considering how long the 2017 car was already. What kind of velocity does the air coming out of the cooling exits have? Is there any advantage to having them exit over the diffuser like that? 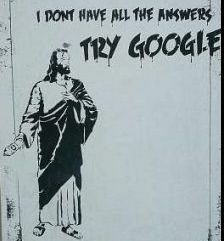 Other than simplicity. The air will be hot and thus lower density than ambient. Although the airflow might be slower than that immediately around the openings, the temperature induced lower density might allow the same effect i.e. to reduce the pressure difference above and below the floor at the diffuser's exit. 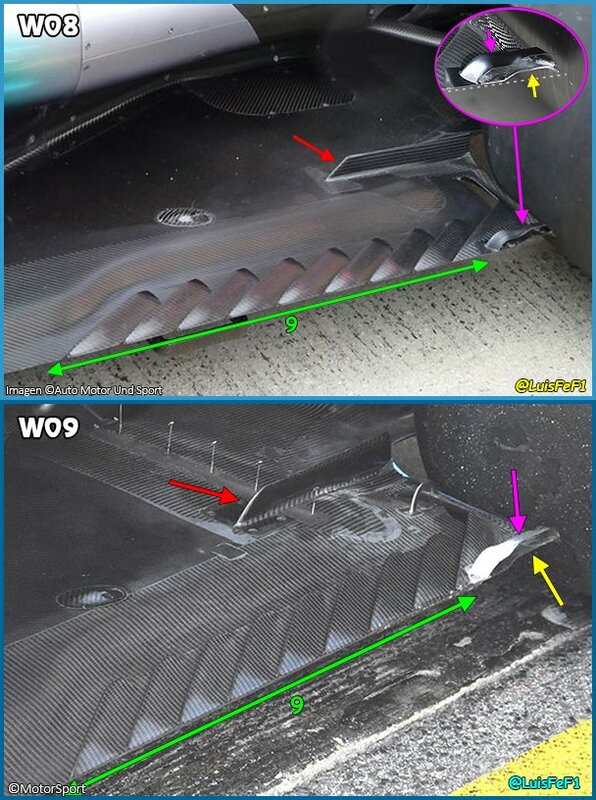 The diffuser's job is to bring the pressure of the air exiting from below the floor back to the same as the pressure around the car (ambient). By having fast air moving over the diffuser, you reduce the pressure differences between the flows above/below the floor and there is then less drag as the flows merge. Fast air is lower pressure, as is hot air. So having hot air means the same benefits as "fast air". 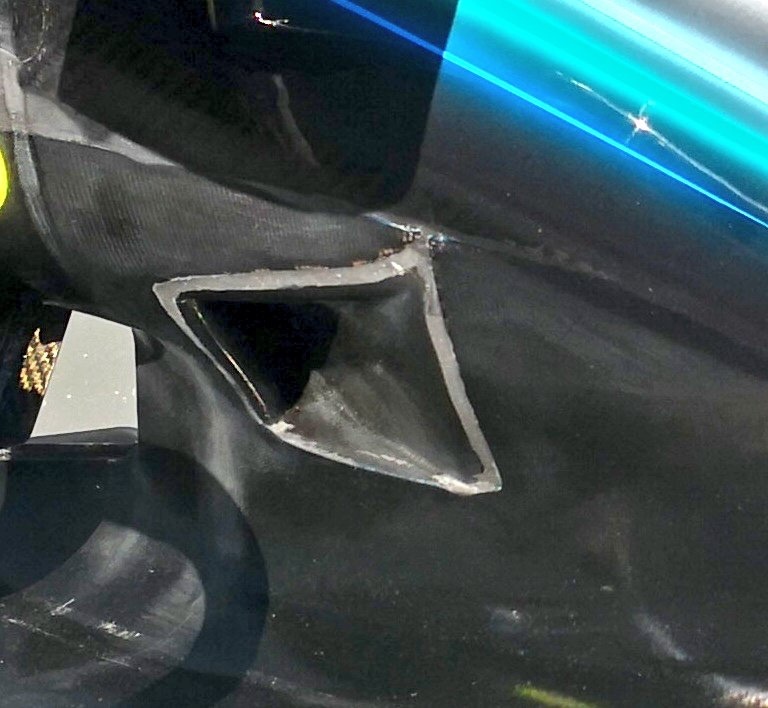 The teams have to dump the hot air somewhere and doing it this way helps the aero performance. That's my entirely amateur "first guess". Oh, and having hot air blow below the rear wing would give an enhanced pressure difference across the wing too - more downforce at a given speed. Although I doubt this effect is what they're chasing here. Yes and no - yes, the cooling flow is basically useless, no, the placement *does* matter. Its placement can determine how much suction the aerodynamics provide to help drive air through the car's interior, which can allow them to shrink radiators etc. 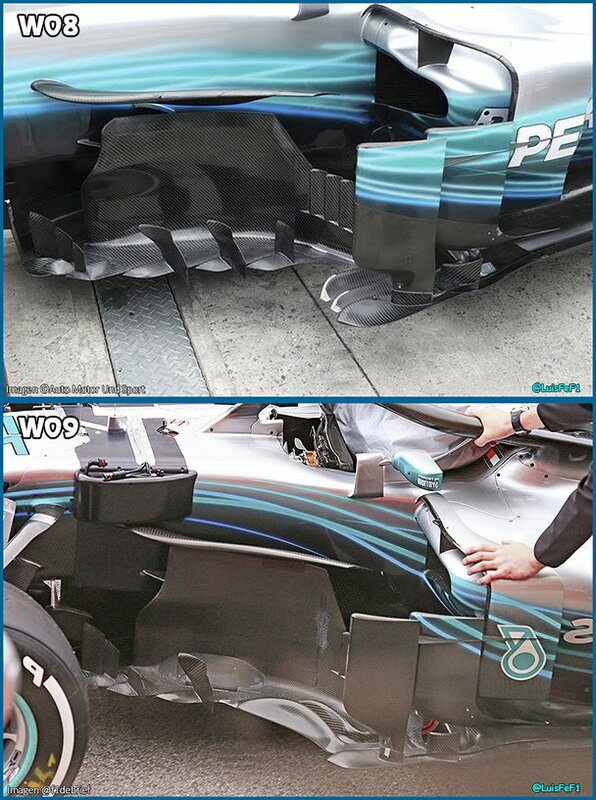 Are those 2 "lips" on the second layer of Gurney flaps new? You're telling me that by pictures alone you could tell if the car was 2.5" longer? If so you need to be checked for superhuman ability. That's an inch shorter than the width of a business card. Lifelong F1 fan from Southern Georgia, United States. There not "lips". As you can see in the image below the top edge of the diffusor splits into 2 about 150mm into the horizontal plane, then 1 then 2 again. One [the lower inside] goes straight through to the other side while the top rises up and does the saw teeth bit behind 2 winglets [which look very upright] next to the rear crash structure..
Just on the 2 upright winglets, they must come under some pretty huge force when going at high speed and pretty much just block the air [like putting your hand out of a car window]. 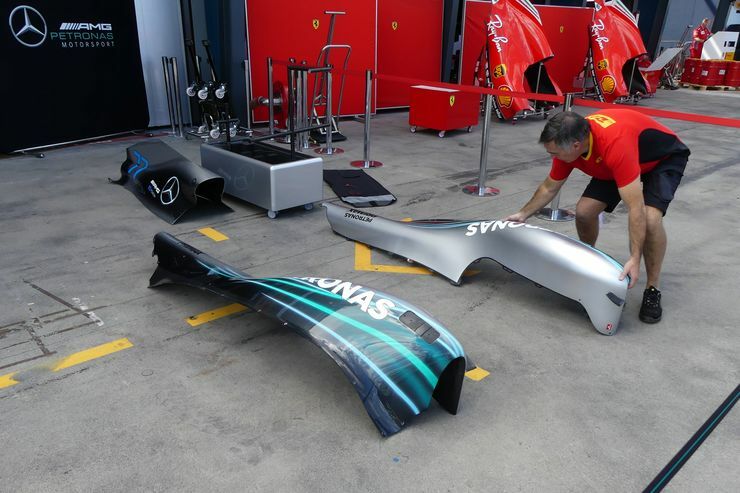 Would Mercedes do this so the diffuser central section doesn`t have a downspill of turbulent air? Well, one it only works because the crash structure is causing blockage at one side, two they should turn enough air to help link the diffuser/exhaust/rear wing flows, and yes, you would imagine with that sharp edge they'd send a pair of small counter-rotating vortices down the side of the crash structure which might help extract the diffuser before they converge. I think that's probably secondary though and the main effect is just to turn the flow hard, especially given the sawtooth element below. You're talking about the vortex generators or the jagged surface where the crash structure and diffuser meet? 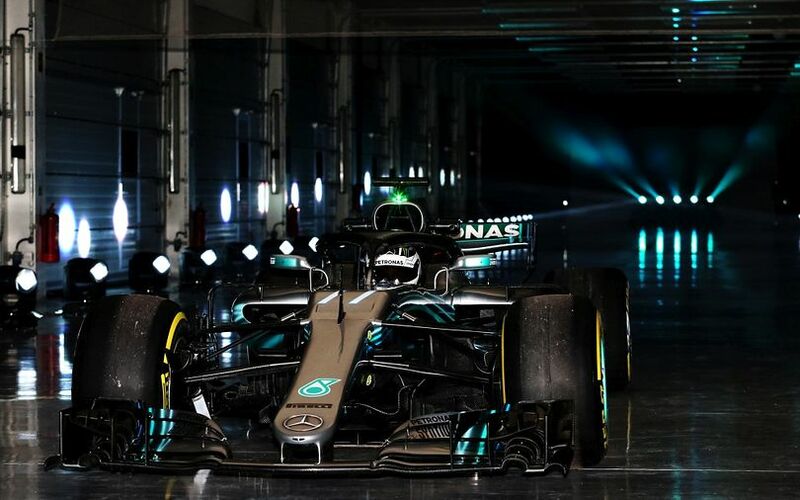 W08 Abu Dhabi vs W09 test spec. "L" elements being the big difference. Looks like the older version was cut out and an updated one was crudely bonded in.